The owners of two French fashion houses have promised a total of €300 million to help president Emmanuel Macron fulfill his promise to rebuild the famous Notre-Dame cathedral, which was partly destroyed by a fire last night. The main structure of the 850-year-old Gothic building was saved by teams of firefighters, but its spire and roof collapsed. 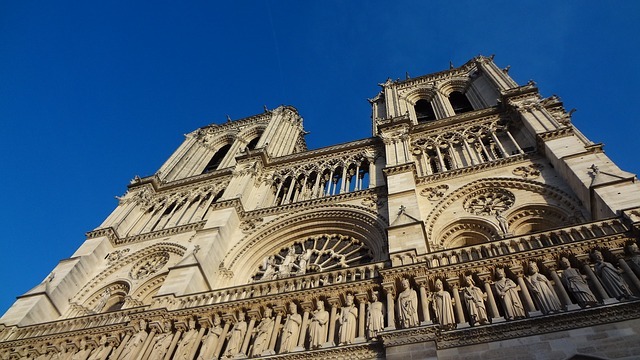 Notre-Dame in Paris is one of France's main tourist attractions and a building that it embedded in French history. As it burned last night, thousands of people gathered on the banks of the Seine to watch, some singing hymns. In an emotional speech, Macron said: "We will rebuild Notre-Dame. We'll rebuild this cathedral all together and it's undoubtedly part of the French destiny and the project we'll have for the coming years," said Mr Macron. The president announced a national subscription will be launched and France will draw on expertise from around the world to reconstruct the cathedral. Billionaire François-Henri Pinault, chairman and CEO of the Kering group that owns the Gucci and Yves Saint Laurent fashion brands, immediately pledged €100m (£86m) towards the reconstruction, and later Bernard Arnault and his LVMH luxury goods group promised €200 million. The French charity Fondation du Patrimoine is launching an international appeal for funds for the cathedral, which is a UNESCO World Heritage site. Firefighters said it will take several days to dampen down the blaze, the cause of which has yet to be confirmed but it is believed to have been linked to construction work that had been taking place inside the cathedral. While the building has suffered extensive damage, many relics, including the Crown of Thorns, were saved.